This is an interesting main-dish salad that, thanks to canned beets, is really quick. It is a great use for leftover lentils, you could even use other beans. You can use any salad green, however, arugula, gives a nice spice to the salad. The cumin vinaigrette is great with other salads as well or just as a dressing for lentils. Make the vinaigrette by heating the oil in a medium skillet and sautéing the shallots. Add the cumin and cook 1 minute. Remove from heat and add the vinegar, lemon juice, cayenne, salt, and pepper. In a large pot, cook the lentils until tender in salted water. Usually this will take between 15-40 minutes, depending on how soft you like the lentils. You can use vegetable or chicken stock instead of water for more flavor. 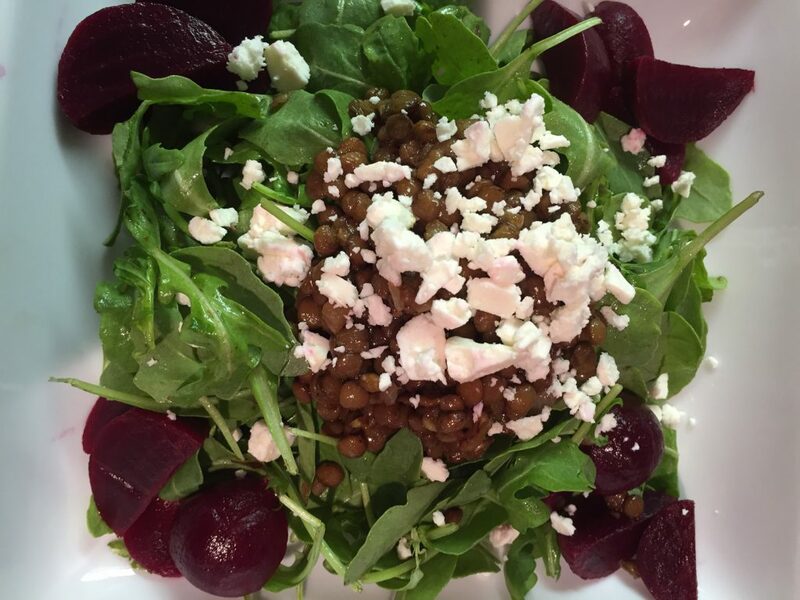 Drain the lentils and toss with ½ the vinaigrette. Toss the arugula in the other bowl with ½ the vinaigrette. Cut the beets in quarters and divide between 4 plates. Place ¼ of the arugula on each plate. Top with ¼ of the lentils. Divide the feta cheese between the plates.